Arriving back in Kyoto, Sayuri feels like a lake quivering after being struck by a stone. A few days after her return, Sayuri goes to Mameha’s apartment. Sayuri assumes that Mr. Itchoda told Mameha about what happened between Sayuri and the Baron, but if he did, Mameha shows no indication that it bothered her. Excited for Sayuri’s performance in the upcoming dance, Mameha seems as devoted as always to making Sayuri a success. On the night of the performance, Sayuri tucks the Chairman’s handkerchief into her sleeve as she puts on her costume. Sayuri is playing a maiden who goes for a swim and falls in love with a dolphin prince. Her costume is a pink kimono with a water design in grey. After she gets ready, Sayuri goes backstage to watch Mameha’s performance. The fact that Sayuri keeps the handkerchief shows that the Baron’s disgusting acts have not shattered her hope that love can exist for a geisha. The subject matter of Sayuri’s dance also reinforces her connection to water. Mameha’s dance tells the story of a married courtier who carries on an affair with another woman. Sayuri watches Mameha perform the wife’s dance of lament at learning of her husband’s disloyalty. Mameha’s graceful dancing has a significant emotional effect on Sayuri. Sayuri starts to feel like the wife betrayed by her husband. Sayuri’s emotional response to Mameha’s dance shows the power that art has in engendering emotions in others. In this way, an artifice (as Mameha is not actually the courtier’s wife) can produce real emotions in the audience. While waiting backstage to perform her own dance, Sayuri feels a heavy weight descend on her from the sadness of seeing Mameha dance. As Sayuri goes out on stage, she uses this feeling to dance elegantly without difficulty or nervousness. At every performance for the rest of the month, Sayuri conjures up the memory of seeing Mameha dance, which makes her feel that same heaviness so that she can dance with dignity and grace. Once again, the novel links beauty and suffering by showing how Sayuri’s sadness allows her to perform elegantly. By channeling her pain into beauty, Sayuri can cope with suffering. In this way, we could even interpret Sayuri’s role as a geisha – which involves the creation of beauty everyday – as helping her cope with her feelings of grief for her family. One afternoon a few days after the first performance, Sayuri visits Mameha at her apartment. Mameha tells her that bidding has begun on her mizuage. Back at the okiya three days later, Auntie tells Sayuri that Mother wants to see her. As Sayuri goes to Mother’s room, she sees Pumpkin coming out in tears. Sayuri’s graceful dancing might have had an effect on the bidding war. Since dance is such a revered art form, her movements might have spurred the bidders to begin competing over her mizuage. Mother suddenly pulls hard on Sayuri’s earlobe and says that now Sayuri is a very expensive commodity. Referring to Sayuri’s virginity, Mother says that Sayuri must not give away for free what she owes to the okiya. Mother then releases her and more calmly says that Sayuri’s status in the okiya is going to change. Mother says that she is going to adopt Sayuri next week, and explains that this means that Sayuri will one day inherit the okiya. Though Sayuri isn’t sure why Mother changed her mind about adopting Pumpkin, she still feels very excited. Mother makes it clear that Sayuri is not free to come into sexual maturity on her own terms like a normal teenage girl. Instead, the okiya essentially owns Sayuri’s virginity (because of her debts), and can choose to sell it to whoever bids the highest. Sayuri also has little sympathy for Pumpkin, showing that Sayuri has a darker, more emotionally callous side to her, and is still very self-centered. Plaue, Ethan. 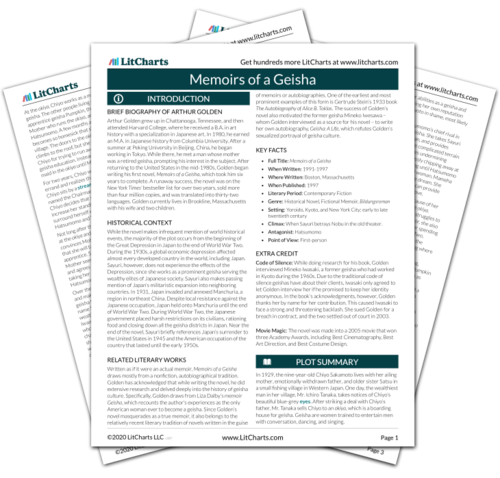 "Memoirs of a Geisha Chapter 23." LitCharts. LitCharts LLC, 4 Nov 2015. Web. 25 Apr 2019. Plaue, Ethan. "Memoirs of a Geisha Chapter 23." LitCharts LLC, November 4, 2015. 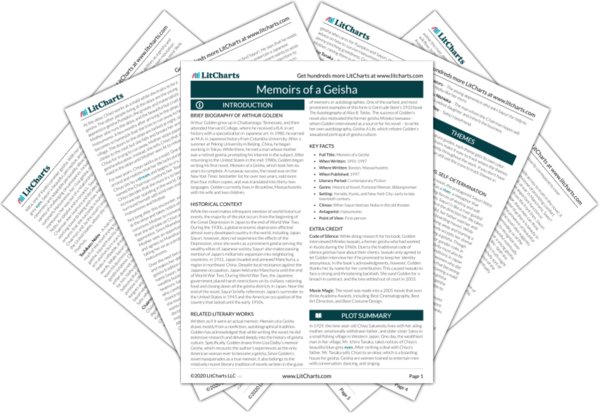 Retrieved April 25, 2019. https://www.litcharts.com/lit/memoirs-of-a-geisha/chapter-23.